Instead, most of the paving projects in B.C. 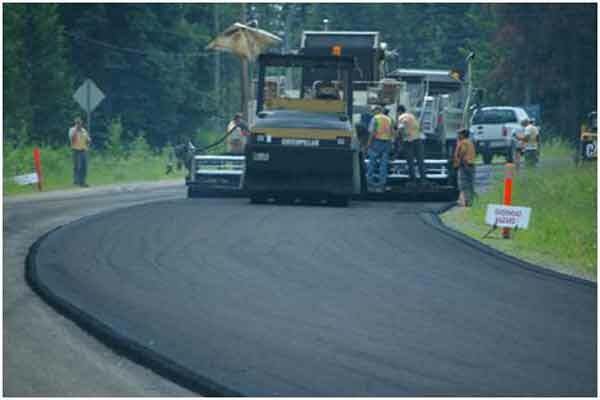 focus on rehabilitation by using resurfacing methods on existing asphalt. To help you identify which method of pavement rehabilitation you’re seeing, we’ve put together a list of the three main methods that the Ministry of Transportation and Infrastructure uses: Overlay, Hot-in-Place and Mill and Fill. 1. Overlay: Overlay can be used when surface defects have not opened or penetrated far into the existing pavement structure. In other words, if the road is in pretty decent shape and we can repair existing cracks without grinding, the overlay can serve to increase the structural integrity of the highway. For this method, we add a fresh layer of asphalt to restore structural strength without having the underlying pavement stresses working themselves back into the new surface. The end result is a road that has a better life cycle than the Mill and Fill process (“life cycle” is how long the asphalt lasts before repairs/resurfacing are required). How does it affect your drive? Overlay takes the shortest time frame to complete compared to the Hot-in-Place and Mill and Fill methods. 2. Hot-in-Place Resurfacing: If the existing asphalt pavement still has some “life in it” (minimal surface cracks and the asphalt binder is soft enough), we can use specialized “train-like” equipment to do the work. First, the asphalt is heated, then re-processed on the spot with new asphalt mix (usually 20%) and finally placed where the existing asphalt was just removed; thus, why we call it “Hot-in-Place Resurfacing”. The bonus of this method is that it rehabilitates the pavement surface in one fell swoop, and with one super machine, saving natural resources and lowering emissions and costs! How does it affect your drive? This method is quick and cost effective. Once the asphalt is compacted and cooled, the road is immediately ready for your driving pleasure. 3. Mill and Fill: We use this method when the pavement surface has deteriorated to the point where it cannot be maintained because cracks, stresses and structural defects have made their way below the surface. This generally means the underlying asphalt layers are still strong and sound to bear vehicle loads. Our paving contractors start by grinding the damaged asphalt – milling (taking off) the affected areas, and then laying down and compacting fresh asphalt to cool. If you’re keen on recycling, it’s interesting to know the leftover ground or milled asphalt is recycled into the new layer being replaced or used on a side or secondary road for resurfacing. This method helps extend the asphalt surface life cycle. For example, Hot-in-Place lasts an average of 8 to 12 years, while Mill and Fill and Overlay projects can last approximately 15 to 18 years. Mill and Fill and Hot-in-Place Recycling projects typically do not require supplementary work found in Overlay projects, which could include roadside barrier improvements and gravel shouldering work. How does it affect your drive? You may have spotted a stage of this process if you’ve ever driven over pavement after it’s been milled and before it’s been filled. Mill and Fill can take a bit longer than some of our other methods, but once the new asphalt is in place, it can be driven on in a matter of hours because the asphalt has been compacted and cools quickly. We will be using a wide range of pavement rehabilitation methods as needed across the province this summer. If you’re on Highway 3 west of the Kootenay Pass or east of Creston, you might see our scheduled Mill and Fill paving project; keep your eyes peeled for the Hot-in-Place recycling method in the Revelstoke area on sections of Highway 1 and 23N; or South of Kamloops on the Coquihalla Highway 5. Try and spot the Hot-in-Place recycling method with the additional 50mm of Overlay paving to add strength to the highway. If you spot flaggers working at any construction, be sure to slow down for them and check out what our paving contractors are up to – and now you can use your new knowledge about paving methods for your next round of roadside trivia.